We live in sad times for bodybuilding. Although broscience is finally losing face, it’s being replaced by what I can only describe as bodybuilding nihilism (‘nothing-ism’). Nothing supposedly matters. Nutrient timing? Just eat when you feel like eating. Full-body or split training? Whichever you prefer. Eating clean? Bro, what has washing your food got to do with anything? Skepticism is great, but it’s turning into pessimism that’s killing the spirit of bodybuilding to always keep improving and always push the limits. The nihilism that nothing matters has taken the meaning that nothing works. When nothing works, nothing is possible. If somebody gains muscle during their contest prep, he is immediately accused of steroid use. That’s because many people believe you cannot build muscle and burn fat at the same time. Others say it’s theoretically possible, but it won’t ever happen in anyone but absolute beginners and steroid users. And yet others say body recomposition programs are the best way to progress and you shouldn’t cut or bulk as a natural lifter. You’ve probably heard someone argue that achieving muscle growth and fat loss in the same day is physically impossible because of thermodynamics. The argument goes as follows. To build muscle, you must store energy. To lose fat, you must burn energy. When you are in energy surplus, your body stores energy. When you are in a deficit, your body loses energy. Therefore, you must be in energy surplus to gain muscle and in a deficit to lose fat. The first two points, the premises, are true. They refer to the first law of thermodynamics (‘movement of energy’), also called the law of the conversion of energy. This law means energy cannot just disappear. It has to go somewhere. Building new fat or muscle cells requires energy and breaking them down releases energy. However, point three, the conclusion, is false. Why? Because muscle and fat tissue are different functional compartments in the body. As a result, your body directs calories towards muscle and fat mass independently. Researchers call this calorie partitioning and the resulting change in fat and muscle mass are expressed as a P-ratio. The body does need other substrates to build muscle mass of course. You need building blocks to build a house. Let’s look at what exactly the body needs. Heymsfield et al. (1982) were kind enough to cut up some dead people for us, so I’ve aggregated their results from the healthy control group in the following image. This is the composition of human muscle tissue. So what do we need to build muscle mass? Lots of water (H2O). You can drink plenty of that during a cut, so no problems there. Several kinds of protein. Again you can eat enough protein on a cut, so no problems here either. For the DNA and RNA we also need nitrogen and phosphate, but those can be derived from dietary protein. 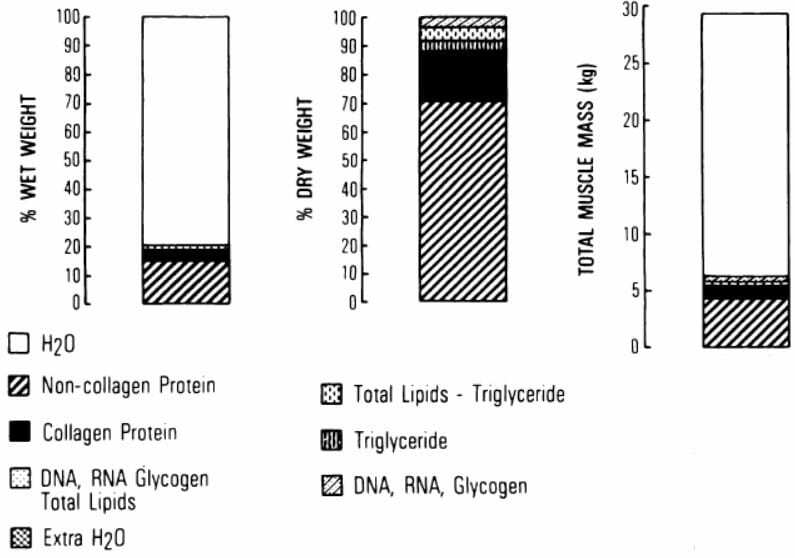 Glycogen and triglycerides. This basically just comes down to energy, because glucose and fat are non-essential nutrients that can be created by the body itself. We need a lot more energy too, because the protein synthesis for the muscle building process is an energy costly process itself. In short, we need protein, water and energy. Where do we get the energy? Easy. Your body has plenty of that. Let’s take myself in average photoshoot condition at about 87 kg, 6% body fat. People think of this conditioning as ‘having almost no fat’, but the truth is, there’s still plenty of fat even then: 5.2 kg to be exact. If we convert that to metabolizable energy based on the density figures I gave in my article about energy balance myths, the body still has over 49000 calories right there for the taking. That’s plenty to build pounds and pounds of muscle without even taking into account you’re still consuming energy in your diet as well. 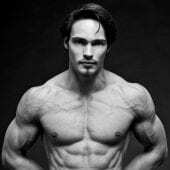 Thus, as long as your body has sufficient stimulus to build muscle mass, which it has if your training program is optimized, it has both the means and the will to build muscle mass while simultaneously losing fat. There you go, muscle growth during a cut. Similarly, your body is capable of storing fat while burning muscle. The conservation of energy law only means that you must gain energy in energy surplus and lose energy in a deficit. It says nothing about how these calories are partitioned or about how your body composition changes. In conclusion, thermodynamics do not rule out the possibility of getting more muscular while leaning out at the same time. Theory is nice and all, but what happens in real life? Do people actually manage to build muscle while losing fat? Overweight (26% body fat) police officers starting a weight training program lost 9.3 pounds of fat and gained 8.8 pounds of lean body mass in 12 weeks. But they were fat, so how is that relevant for us? Ironically, it’s usually the self-proclaimed science-based skeptics that say you can’t build muscle and lose fat at the same time. Yet people in dozens if not hundreds of studies lose fat and build muscle at the same time when they start training, even sometimes when they only do endurance training (see here and here and here, for example). Young, old, healthy, unhealthy, male, female, obese, lean, they all achieve body recomposition. Even on mediocre training programs with crappy diets with suboptimal protein intakes. Even elderly men and women over 60 years old generally gain around 4 pounds of lean body mass with the same amount of fat loss in 12 to 16 weeks (see here and here, for example). But all these people were barely trained, so again how is that relevant for us? Here’s an example of one of my clients that had over 20 years of training experience and was already benching 235 lb (107 kg) for 5 reps before the coaching. He performed a DXA scan every ~3 weeks during my coaching. In 2 months and 18 days, he lost 6.7 lb (3.1 kg) of fat while gaining almost exactly the same amount of muscle. His weight during the last scan was within 8 grams of his weight when we started. So this is an example of virtually perfect body recomposition. You can find the anonymized DXA scan overview here and his progress photos below. Still not convinced? In trained individuals it’s not as common as in beginners to see body recomposition obviously, but it’s still very much possible if you’re on a good program. Many of my clients with access to reliable body fat measurement techniques, such as DXA (think ‘x-ray’) scans, have gained muscle while losing fat. Of course you’d be wise to be skeptical of what I say about my client results, so let’s look at some scientific research. One study looked at elite gymnasts. These were national level athletes with a training volume of 30 hours a week. They could do 17 pull-ups where their chest touched the bar (try doing 1). They were put on a 1,971 calorie, ketogenic diet. In case it wasn’t obvious, that’s pretty drastic for someone training over 4 hours a day. Their fat percentage of 7.6% dropped to 5% – lower than many bodybuilders in contest shape – in 30 days. Even under these conditions, they gained 0.9 pounds of lean body mass. And don’t forget they must have lost a lot of glycogen and water eating just 22 grams of carbs a day. This study and this study both found positive body recomposition in competitive rugby players. This study found positive body recomposition in men benching well over 4 plates. This study found positive body recomposition in NCAA Division football players already squatting over 382 lb (174 kg) and benching over 289 lb (131 kg). Even some women competing in the IFBB have been found to gain muscle during contest prep during a study that carefully monitored their hormone levels. Gaining muscle on a weight loss diet is not only possible, it should be expected for most people on a serious program. As long as the stimulus for muscle growth is carefully designed and customized, your body will find a way to get bigger. Your body is not the enemy. It is a miraculous survival machine that adapts to the stress you impose on it. When you understand it, you can control it. So screw the naysayers. When you don’t believe what you want is possible, you have defeated yourself before you even began.